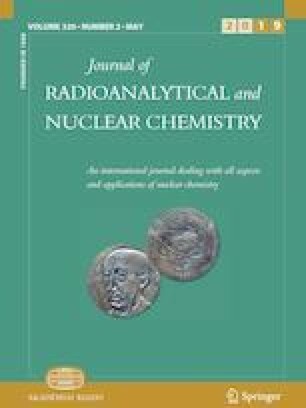 Uptake of Sr(II) from simulated low level radioactive waste, employing radiotracer 85+89Sr, has been carried out with humic acid by a batch equilibration biosorption study. The process exhibited rapid kinetics and at optimized parameters, Sr(II) was biosorbed from simulated reactor and reprocessing waste by 84 ± 2% and 75 ± 2% respectively. Kinetic modelling revealed that the process follows Ho and McKay’s linear pseudo second order kinetics, indicating chemisorption mechanism of binding. Thermodynamic studies ascertain the exothermic, spontaneous and feasible nature of the process. This work proved the viability of humic acid for Sr(II) removal as an eco-friendly, cost effective alternative to conventional techniques. The online version of this article ( https://doi.org/10.1007/s10967-019-06514-9) contains supplementary material, which is available to authorized users.